Destiny Rise of Iron – Armor Quests? I saw a post on the Destiny subreddit earlier today asking why in the current game we have quests that net you both legendary and exotic weapons, but the only quests that earn you armor are the three faction class items. I thought it was a pretty good question to ask – the lore associated with the factions in general is pretty weak in-game and that extends to the quests for the armor; while the weapons we hunt down, especially the exotics, have multiple step quests with clear lore behind them. 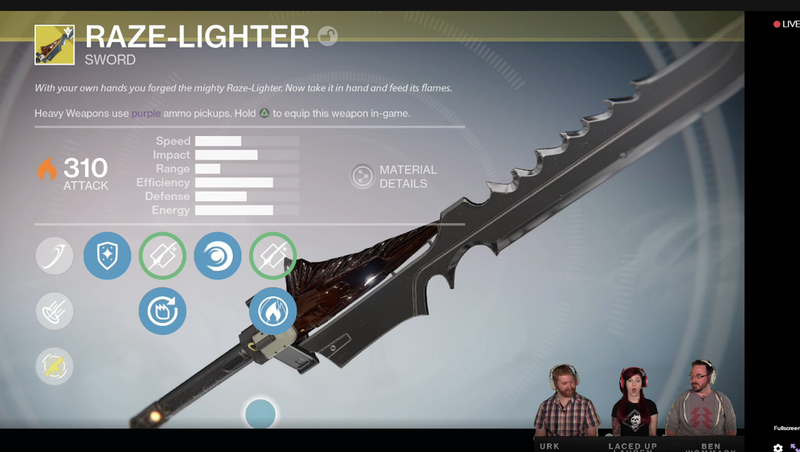 Sleeper Simulant, Touch of Malice, No Time to Explain and the three exotic swords all have their own story. The story behind the class items boils down to you grinding a ton of rep out for a faction. Now, after reading the post, I think it’s probably too late to see anything like the level of detail we’ve got for the weapons coming for armor quests. There’s a new 2.3.1 patch coming our way – we don’t have a date quite yet for it, but I would be tremendously surprised to see any new content coming with it, including the missing Taken King exotics. So while that probably isn’t the answer that a lot of fans really would like to hear – we’ve been saying for a while that we just want more and more with this game – it got me thinking a little moving forward. What I have been thinking is that we may very well get those armor quests, with some actual story behind them, in Rise of Iron. We still are in the dark about a lot of specifics with Rise of Iron – actual story content, strikes, the raid, weapons and armor all still are unknowns. What we do know is that we are going to, at some point, pay homage to the fallen Iron Lords at Felwinter Peak. What that actually means we don’t know for sure, but I see it ending with a full suit of armor and hopefully a suite of weapons too. That has me thinking that at some point, whoever resides in Felwinter Peak will give us a whole bunch of quests. I mentioned this a few weeks ago with some of my predictions for Rise of Iron that I want these Iron Lord quests to be numerous and rewarding. I want there to be a bunch of these quests, and I want them to each earn you at least a legendary – quests to get you a helmet that is similar to Colovance’s or a set of gauntlets that maybe Jolder would have worn. That will immediately put some much needed lore into the armor, as well as make the quests more engaging. Keep them from all being the same requirements, which is tricky, and you might have the one of the best aspects of Rise of Iron‘s PvE side of things. One of the things that I think we as a community have been asking for is direct paths that are predictable and known toward power – that’s a big part of why we liked the quests because we knew what we were heading toward. I want more of that as we move forward with the unique loot – it doesn’t have to be exotics in my mind. Now that we’ve spent a good month playing around with Destiny: The Taken King, I think it’s becoming more apparent how Year Two is starting to shape up. At this point in Year One we were all still learning the ins and outs of Crucible play, Iron Banner, Queen’s Wrath and raiding – while maybe working through our alternate characters. Now though, we are settled into a more stable routine – every day I play starts with running bounties on my Titan, cleaning up a few other things and then either playing PvP or switching to an alt to run PvE stuff. What makes this possible really is twofold – first is just that we’ve had the game for over a year now; but the second is a change that’s taken place in The Taken King. With 2.0, Bungie shook up everything – including the bounty and progression system. In particular, they added in a new way to move through different series of missions with the Quest system. Those Quests may actually be the best change that happened that isn’t a direct change to game performance. With the Quests, you can pick and choose which missions you’re focused on – and see what the rewards will be. That’s great for new players who didn’t come in to The Taken King overleveled – they can see exactly which Quest gives them the new item that they need to move up. For more experienced players though, the best Quests are the ones that provide direct pathways to the new Exotic weapons. They take the idea of the Exotic bounties from Year One, and stretch them out a little. What makes the Quests better than the bounties is that the Quests aren’t randomly awarded – you are given them after reaching set points. With the new kiosk system, getting Exotics is more important than ever – especially if you run multiple characters. I can do a quest on my Titan – like the Sleeper Simulant – and know that once I get the Legendary Marks, I can pick up another on my Warlock or Hunter if I wanted. That makes doing those quests pretty high on my to-do list on my main character. The Quest system also opens up a whole slew of new possibilities for Bungie moving forward. They’ve already shown that there’s the possibility for secrets in The Taken King. There’s no reason to assume that there isn’t or can’t be secret or future Quests. With the new microtransactions that have been added in, the new manner of putting out DLC is still a little up in the air. I would be willing to guess that we might see content drops that could be a group of Quests for free moving forward – perhaps even Exotic ones. I know that there’s a lot of content in The Taken King. I play almost every day for a little bit, and I haven’t finished everything yet. We have even more content dropping this week with the return of Tess Everis, Iron Banner and Trials of Osiris. It’s easy to get a little overwhelmed – just pick a couple Quests and run through them.